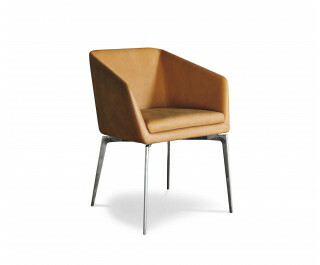 Minimalism, quality and glamour are combined in this compact chair. Highly versatile, Denise can be used in a variety of settings, both residential and contract. The steel frame is coated in flexible polyurethane foam and finished with a leather or fabric cover. Both versions are available in a wide range of colours. Denise has a die-cast aluminium base and an upholstered seat made from polyurethane rubber and Dacron for maximum comfort.